Northern Mat & Bridge has a vast inventory of access matting, rig matting and portable bridges that can be utilized to gain access to remote areas for emergency response activities caused by: pipeline breaks, train derailments, forest fires, landslides and floods. By minimizing the reaction time to such unfortunate incidents we can help contain and clean up the incident quicker, minimizing negative impacts on the environment. Immediate access to both industrial and natural disasters is crucial. Every hour saved in such environmental situations can protect an immeasurable amount of plants, animals and water. By providing turn-key delivery and installation services, along with having an extensive inventory of access mats and portable bridges, Northern Mat & Bridge can gain access quicker, safer and more efficiently than anyone. Many of our customers realize that when faced with an emergency response typically the first step in a response is access. In order to provide assurance to a customer’s emergency response plan, Northern Mat & Bridge has worked with our customers to build our products and services directly into their emergency response plan in order to streamline the safety and efficiency of the response. Our experience speaks for itself. 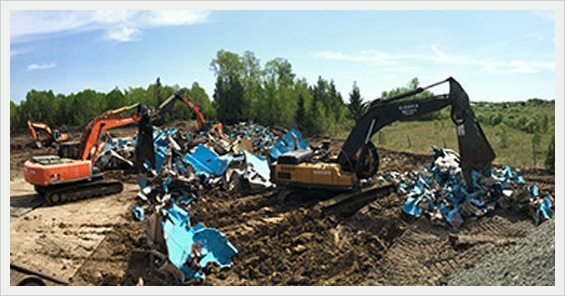 To date, Northern Mat & Bridge has worked on numerous pipeline breaks, floods and train derailments where our products and experienced crews were pivotal in providing access for emergency crews to assess, clean up and minimize any environmental damage. Our methods are safe, efficient and minimize the impacts on the environment while at the same time providing the vital access for emergency crews to conduct their clean up.